Ultra Optimizer is the most advanced Windows Registry Cleaner and System Optimizer available anywhere today. Ultraoptimizer will Fix errors on your PC, and Increase your Systems Performance considerably. Our high tech scanning engine will detect & fix more errors on your computer then any other Registry cleaner Available. Ultra Optimizer has many build in tools, and is much more then an Advanced Registry Cleaner. 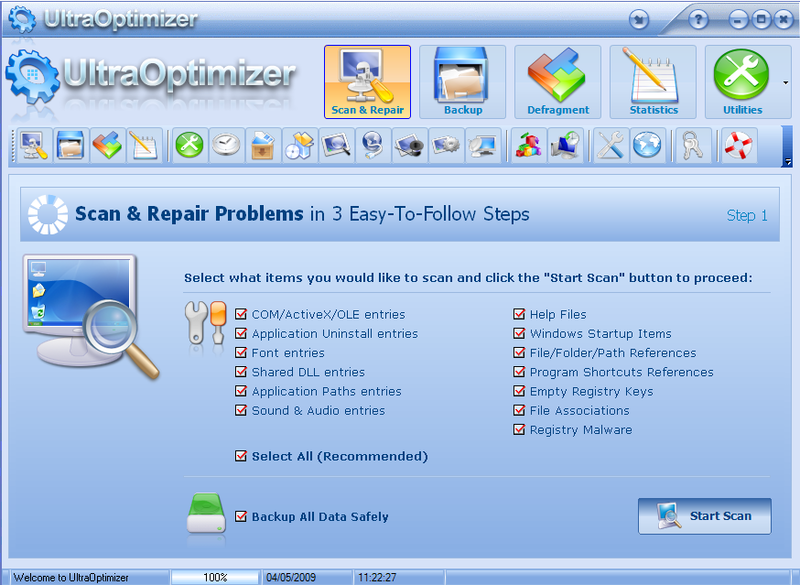 Ultra Optimizer is the most advanced Windows Registry Cleaner and System Optimizer. * High-performance scanning Engine Detects and Repairs Computer Errors. * Increase & Optimise PC Performance, Remove redundant entries. * Improve your system's overall performance and Windows boot-up speed. * Evidence Cleaner and Privacy Protector. * Redundant File Remover, removes all unneeded/ duplicate files. * Advanced secure file shredder, remove files securely, without leaving traces. * Advanced memory optimizer for improving memory performance. * Advanced startup manager, fully control what programs start with Windows. * Smart Registry Defragmentation,defragment your system registry. * Clean registry malware and protect your computer's security and integrity. * Internet Explorer plugin manager, enable/disable or remove unwanted IE plugins. * Automatic or Manual Error Removal. Qweas is providing links to UltraOptimizer 2.1 as a courtesy, and makes no representations regarding UltraOptimizer or any other applications or any information related thereto. Any questions, complaints or claims regarding this application UltraOptimizer 2.1 must be directed to the appropriate software vendor. You may click the publisher link of UltraOptimizer on the top of this page to get more details about the vendor.